We’d originally expected to be holding down left-click to read a perp’s rights to them before Christmas – but early beta feedback was so sharp-tongued that Battlefield Hardline was delayed into 2015. There’ll be another Battlefield Hardline beta before launch, in which we’ll get to test everything Visceral have changed about the shooter since June. Executive producer Steve Papoutsis says we can expect new approaches to all sorts: especially heavy weapons, faction distinction and recoil. Visceral believed that heavy weapons and explosives were an essential tenet in Battlefield’s ‘rocket, paper, scissors’ weapon balance system. But beta players understandably scoffed at the idea of bank robbers planting mines, and the dev team have since worked out an alternative course. Hardline’s most powerful weapons are now pick-ups placed around the map as secondary objectives. For instance, only the team that controls the RPG cache in Battlefield Hardline’s Hotwire mode has access to the shoulder-mounted explosives. In another bid to better fit the fiction, meanwhile, some of the game’s special weapons are tied to the trunks of vehicles rather than player inventories (“It goes back to movies where bad guys pop open the trunk to grab something big,” explains Papoutsis). Moreover, Papoutsis suggested that Battlefield 4 players would be surprised by Visceral’s approach to recoil and bullet flinch – i.e. the degree to which the player’s camera is affected when firing or under fire. “The non-Battlefield veterans may not notice the subtleties,” he noted. All that should ensure Hardline has its own flavour. But in one other sense, the game has been pulled closer to its predecessors by beta feedback. Like previous Battlefield games, Hardline now has faction-specific weapons, available either to cops or crims. 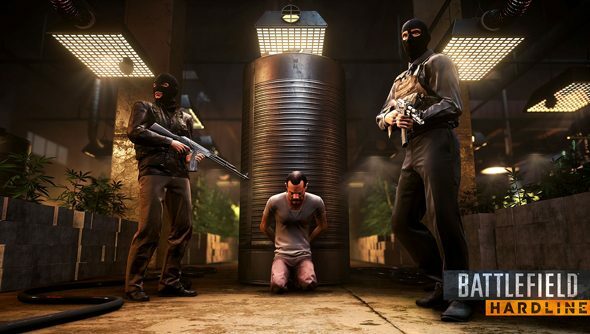 Did you play in the first Battlefield Hardline beta? What did you make of its domestic twist on the series formula?